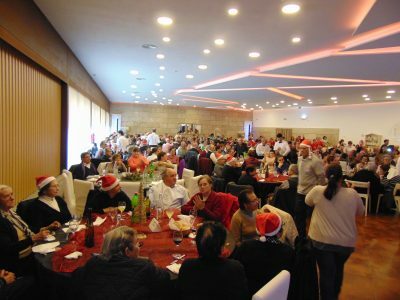 The Municipality of Póvoa de Lanhoso currently has a network of nine recreation centres which serve 175 people that work in partnership with the Parish Councils. The last one opened in 2nd of june 2018. Strategically, the municipality aims to expand this partnership to every parish council in Póvoa de Lanhoso. There are 22 parish councils in the municipality. Póvoa de Lanhoso has approximately 3931 people over 65 years old. Recreation centres aim to reduce social isolation of seniors that, in a large number, live alone. Recreation centres aim to promote quality of life, through various activities that are offered, in a weekly basis, such as music, cognitive stimulation, physical exercise, entertainment activities, handicraft, cultural and social events. These networks are currently implemented in nine parishes, namely Friande, S. João de Rei, Vilela, Esperança/Brunhais, Fontarcada/Oliveira, Rendufinho, Ferreiros, Póvoa de Lanhoso e Travassos. Each centre functions in older primary schools that were reactivated for this purpose. The transportation of older people that have mobility difficulties is ensured by the Parish Council as well as the afternoon tea. The management of the activities is guaranteed by the Municipality. Participating in these group activities allows older people who are isolated to maintain their functional ability (music, cognitive stimulation, physical exercise, entertainment activities, handicraft, cultural and social events). It also contributes to the promotion of physical and mental health, social interactions and postpones institutionalization. The impact has been very positive, measured by the high level of satisfaction expressed by the beneficiaries, the growth in their self esteem and joy of living. The Municipality plans to open more recreation centres shortly. How collaboration worked: This project has been done as collaborative work between the municipality and the parish councils. Each parish council defined how they could contribute to the project. The municipality made available the old primary school buildings and the set of professionals to manage the activities (planning, preparing and helping in the course of action). The parish councils made available transportation and the afternoon tea for beneficiaries. When necessary other social and health local institutions collaborate in specific activities, namely larger group social and cultural activities which include the technicians and the beneficiaries of those local institutions that participate also. Details on older people's involvement: Without their interest, enrolment, presence and participation none of the seven recreation centres would have seen the daylight. Older people collaborate in the definition and developing of the activities by expressing their opinion and suggestions. It is being done an evaluation work by an university student but the results aren´t available yet. Each of the nine recreation centres has its own dynamic. Some activities please more to the beneficiaries than others but, in general, the feedback has been very positive. The negative aspects that are brought up by the beneficiaries in the evaluation of the activities, sometimes related to organization aspects (for example, transportation) are considered very important to improve. Yes, it is expectable to open one more recreation centre soon. It has been a great experience and we know that there is a lot we can do to improve and promote other activities such as technologies, for example, but we don’t have the financial resources to get there yet. First, it was challenging to motivate the beneficiaries to get out of their homes to experience something different. To address this challenge we used communication, sincerity and empathy. In present time, the great challenge is the necessity to expand the team of professionals.